I'm Johnathan and I've been doing this webcomic thing for over 14 years. I started in 2003 with a comic about six 20 somethings called A Rusty Life. In 2012 my love of comic strips led to the development of Stairwell. Stairwell is about a guy named Norman who not only talks to himself, but sees and communicates with a manifestation of his brain. Stairwell is a full color strip and was updated daily for three years before I took a vacation from it and updated occasionally in 2016. After the well-received Stairwell Volume 4 Kickstarter, I returned daily in 2017 as one of the stretch goals. However, with a full-time job and a lengthy commute, creating a daily comic has always been a labor of love. A daily schedule often means I have to work through vacations and holidays to stay up to date. The end result is that I get to deliver a comic strip in the same tradition of daily comics that I have always admired and loved! A contribution of even a few dollars a month supports Stairwell's costs, and allows me to continue manning a booth at local, west coast, comic conventions. Part of the work is getting Stairwell out in front of people and it's been a joy to have recently had tables at Jet City Comic Show, Emerald City Comicon, and Rose City Comicon. Your contribution also supports development of future products and events like the upcoming 'Stairwell Volume 5' book, Stairwell’s integration into Comic Chameleon, or my ability to adventure out to other conventions around the country. Your Patreon pledge supports Stairwell and the tradition of daily comic strips as well as give me the chance to reward my most loyal supporters! As my Patreon supporter you'll have exclusive access to the Patreon posts and other cool stuff. Come aboard and help support Stairwell in keeping the daily comic tradition alive! 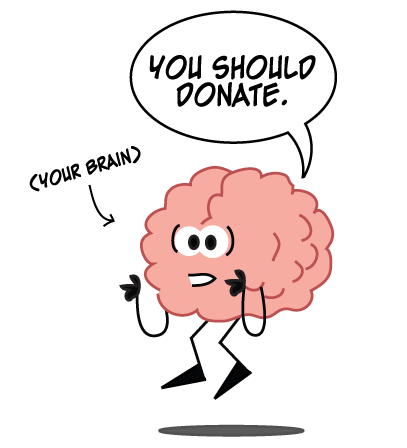 Your brain commands it! For only $1 a month you can help contriute to the Stairwell creative effort! This tier will get you access to the Patreon feed which will include occasional behind the scenes things, rough drafts, character sheets, and whatever I think you guys will find interesting. This tier will get you access to the Patreon feed but it will also enable access to other premium goodies! Example awards may include digital PDF copies of books, discount codes for physical books, post cards sent to your door, exclusive comics, live streams, and more! I've been working in a 5 year old copy of Adobe Illustrator and your combined donations of at least $50 a month allow me to finally upgrade to the latest Adobe Creative Cloud and use the new tools to hopefully create new and interesting work!